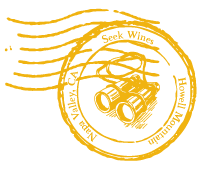 Seek Wines | Where is that? This is our friends’ vineyard in northern Wisconsin. No. Wait. This is their friends’ vineyard in northern California. Yep, this is what we awoke to on March 5. It would be heart warming on December 24, but not so much in March. What a year it’s been – 60+ inches of rain and now snow. 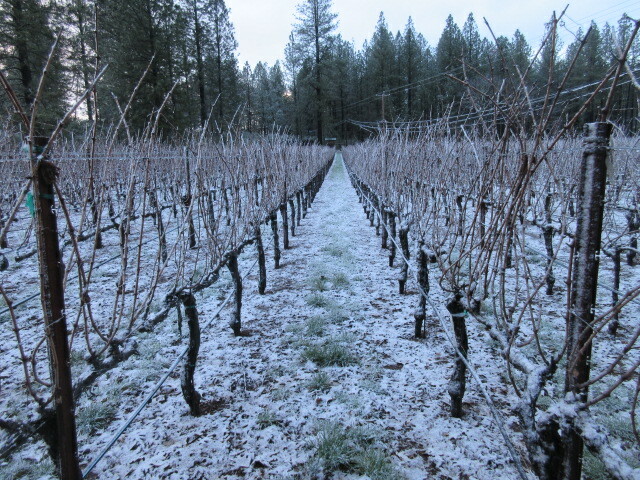 We’re trying to prepare the vineyard for pruning, but it’s been challenging. We feel officially old now, both turning 60 this year. We start work a little later in the morning, we stop a little earlier in the afternoon, and we don’t work in rain or snow. We also have to take more breaks (at least the older one of us does). 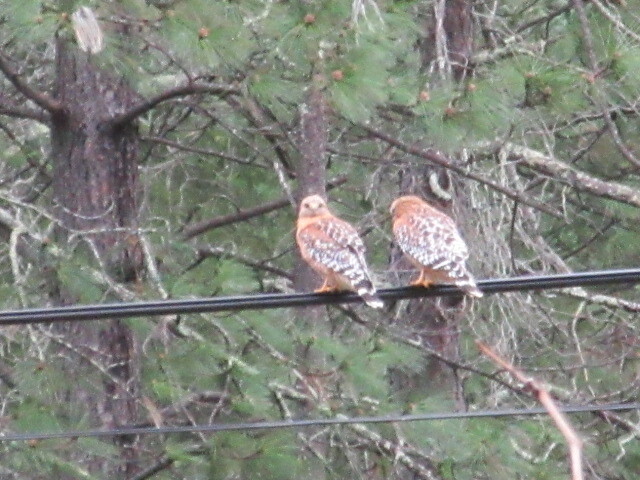 We’re happy to see our guardian Red Shouldered Hawk couple return for another year of hunting. How do we know they’re a couple? Let’s just say recently we saw their high wire act and wish we hadn’t. They do a great job of reducing the gopher and mole damage in the vineyard. 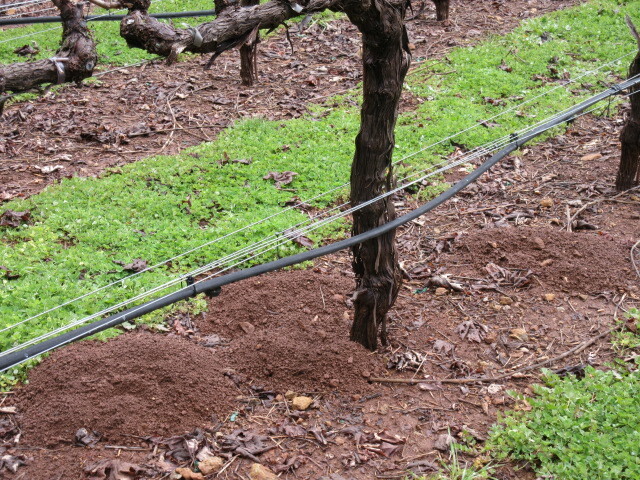 Gophers and moles dig tunnels throughout the vineyard. When they chew through vine roots, the vine usually dies. They also leave behind large piles of dirt that have to be flattened before we mow the vineyard. Pound for pound, they are mighty earth movers. We have telephone wires that cross about 10 rows. When the hawks arrived, we noticed that the gopher damage was concentrated in those rows. The hawks like to sit on the wires for a better view of the hunting ground, but they don’t like to fly under the wires. We sought reinforcement. Look at this cat we affectionately call Tom. He’s big, reliable, and serious. 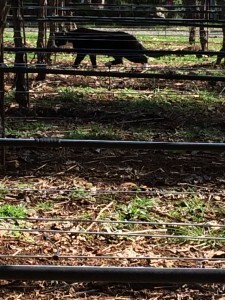 He shows up everyday and works the wire rows. He has the gophers and moles in that area all to himself. 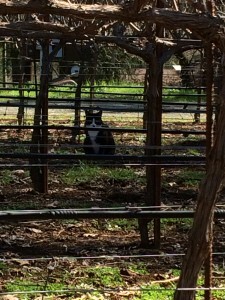 He also probably knows he’s protected from the hawks when he’s under the wires. Apparently, all these critters are remarkably savvy and adaptable. We don’t know where Tom lives, and we suspect his owner doesn’t know where he hangs out. As far as we’re concerned, it’s all good. Do you know where your cat is? We are very pleased to announce that effective this month, we are producing annually 3 Howell Mountain wines, our original vision. This month we bottled 50 cases of 2015 Howell Mountain Zinfandel. We finally persuaded a neighbor to sell us some of their exceptional Zinfandel grapes grown above us high on Howell Mountain. 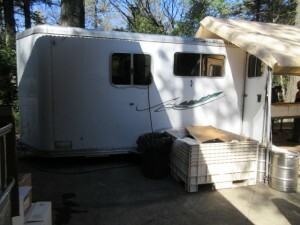 The accompanying photos show the wine being bottled and boxed in a mobile “horse trailer.” Glamorous right? 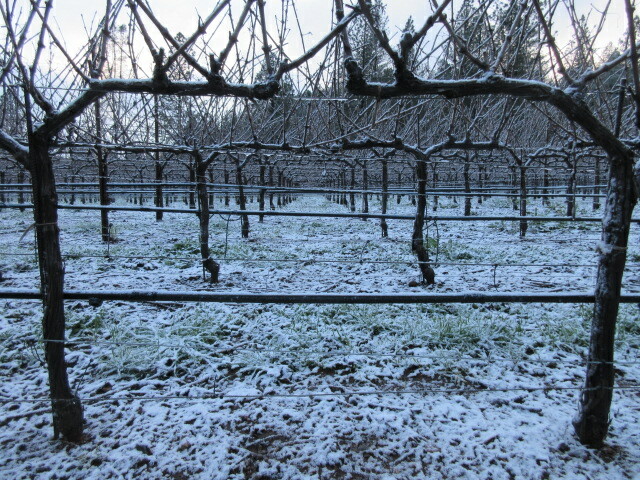 This means that we are no longer producing our Napa Valley Zinfandel. 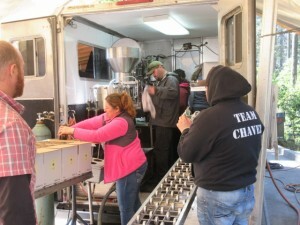 Our friends who own that vineyard are now selling their Zinfandel grapes to a prominent Napa Valley winery. We are very happy for them and grateful that we could produce our 2013 and 2014 Zinfandels with their delicious old vine fruit. Our 2013 Zinfandel and 2014 Howell Mountain Cabernet Franc are sold out. We have some 2014 Napa Valley Zinfandel remaining for sale. If you haven’t tried it, or you have and you’re a fan of this final production, it’s a good time to order it. In the fall, we hope to release our 3 new wines, including the 2013 Howell Mountain Cabernet Sauvignon from our vineyard as well as the 2015 Howell Mountain Cabernet Franc and the 2015 Howell Mountain Zinfandel from our neighbors’ vineyards.